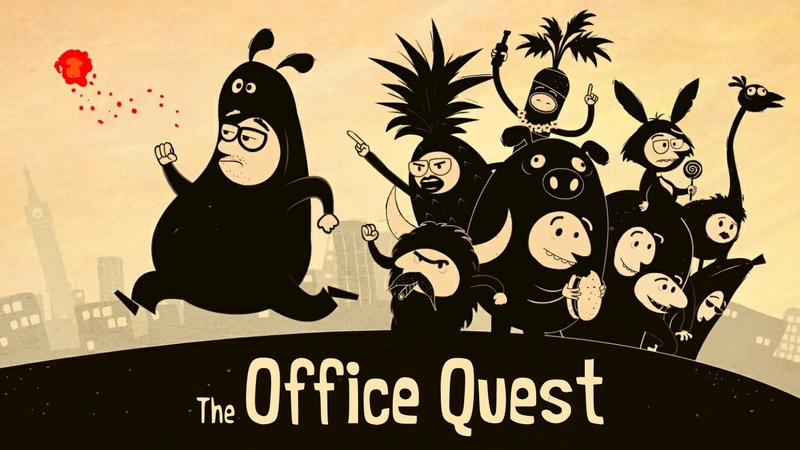 I wasn’t planning to write a full review for Deemedya’s The Office Quest, but I’ve been raging so much about it on Twitter that I figured I should compile my thoughts into a review for those who don’t follow me on there. It’s been quite a rollercoaster ride, as the game has the makings of what could be a true classic, but deceptive pricing and some rage-inducing mini games hold it back from greatness. The Office Quest starts off promising. They give you the first short chapter for free, but it’s unique, the artwork is charming, the characters are quirky — even if they don’t talk — and the puzzles are creative. The first chapter also doesn’t include any frustrating or tedious puzzles or mini games. 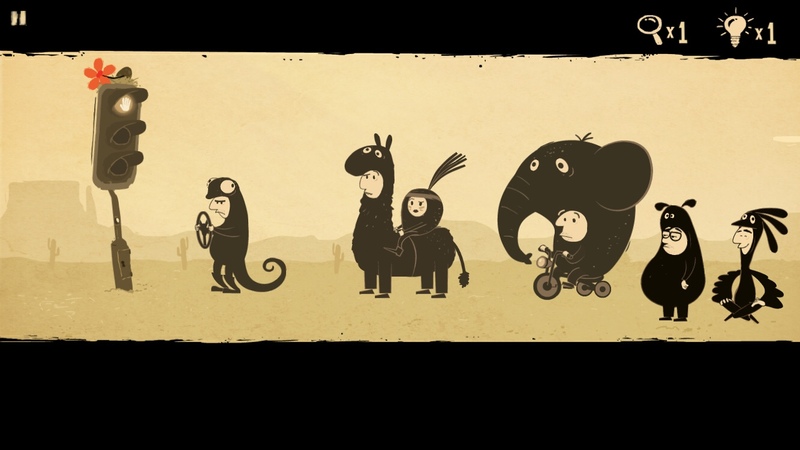 It’s a proper adventure game that asks you to work your brain, not your reflexes or patience. The basic premise is that you are chasing a little red light that seems to always be just out of your reach. One section has you distracting your boss so you can sneak past his office. Another has you brewing special drinks for your coworkers and sneaking under the conference room table to give it to them. And did I mention that everyone, for some unknown reason, is wearing costumes such as animals or vegetables? It’s a short but enjoyable chapter and you can’t really complain about the length because it was free. Because I enjoyed it so much, I paid the $2.99 the game requested in order to continue to the second chapter. I assumed that would allow me to play the rest of the game, so I didn’t really think much about it. This seemed like something really special and I wanted more. Unfortunately, what the game and the App Store description do not tell you is that you’re paying $2.99 for just the second chapter. And at the time of release, it took maybe fifteen to twenty minutes to complete. It started off with a tedious pipes maze, where you have to climb through pipes with no real idea where they lead but hope you take the right path. It’s slow, it’s tedious, and just feels like it was used to pad out a ten-minute chapter to fifteen minutes. Otherwise, the short second chapter was pretty interesting, if not as clever or charming as the first chapter. But it was over quickly, with no warning of this and simply an option to sign up for emails to be notified when new content is released. Fast-forward to a few months later and they added a second half to the second chapter as well as a third chapter you have to pay another $2.99 for. We’ll get to that soon. First, I’d like to talk about the second chapter. Instead of giving an option to start with the new content, you’re forced to replay the entire second chapter, including the stuff you already completed. Like the tedious pipes maze. 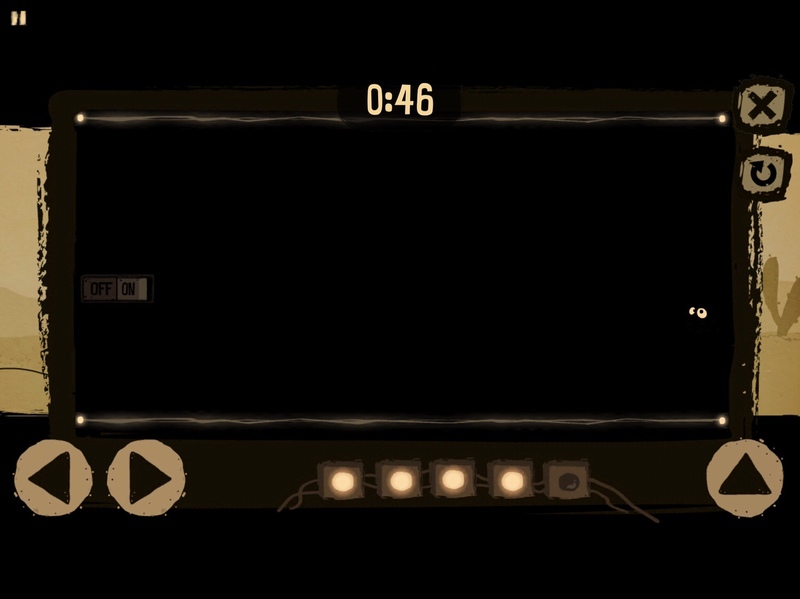 Then, the first thing you’re tasked with is a memory mini game. You know, where you have to flip cards over and find two that match? Yeah, the kind you might have played when you were a wee kid, only with real cards and without any limitations. Here, you have sixteen TV screens that you turn on in pairs. You have exactly six tries to find all the pairs. Each time you miss a pair, the counter runs down. At zero, everything resets itself and you have to try again with all the screens re-scrambled. It took so many attempts for me to get this because it’s mostly luck-based and I just didn’t care for it. Every time I failed I just got more annoyed and more likely to fail. When I did finally pass it, I took a break. And learned the hard way that the game doesn’t save until you complete the whole chapter. So I had to pass it again, and this time get through the rest of it in one sitting or I’d have to do it all again. 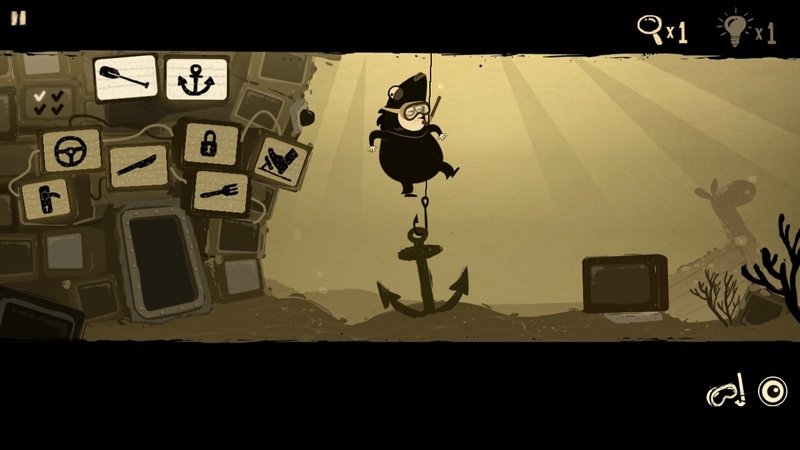 Now, I play a lot of adventure games and I don’t expect every puzzle or every mini game to be interesting. I know there’s going to be some filler and fluff even in the best games. It’s just the nature of the genre. But there are some puzzles that are boring, uninspired, tedious or rage-inducing enough that they can taint an entire game. This was one such mini game, as it’s all those things wrapped in one. A little more forgiveness might not have made it any more interesting, but it at least wouldn’t have made me so angry. In any case, I’d be happy never to see another memory matching mini game again. Ever. Please, leave them out of your adventure games. 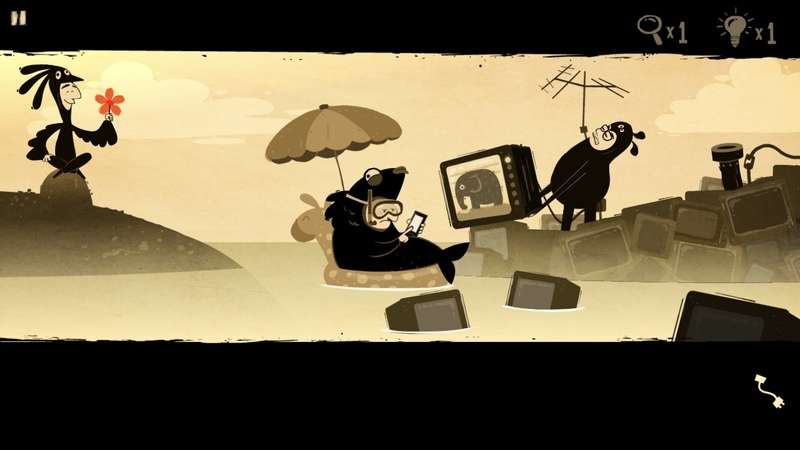 They just make the developer look lazy and uninterested in coming up with something more fun. Anyway, I got past that and was actually enjoying myself. Despite still being angry that I couldn’t take a break without losing my progress, there were some cute and clever puzzles where you have to text emojis from another guy’s phone to get his friend to react to them. But before I knew it, I was faced with another frustrating mini game. You have to solve four riddles in a row without getting any wrong. You compare two items shown and then choose two other items that relate similarly. For instance, a man and baby are like a frog and tadpole. Or a table and teacup are like a head and a hat. But then you get to some that make no sense, like a bell and the dangly thing inside a bell. Two options are a razor and a razor blade, which seem like they should be an answer but they’re not. A snail and snail without its shell are. Others show cars and a foot on a pedal, but it’s not clear whether it’s the gas or the brakes. Since the original images you’re comparing to are an oar and an anchor, a steering wheel and a foot on the brake would make sense, yes? But the answer is a lock and doorknob. Come on! How does that even make any sense? At least this one was less tedious than the memory game, but if you get three right and then the fourth wrong, you have to start from scratch. It gets old pretty quick. And again, I need to hammer this point home — you can’t take a break without having to restart the whole second half of Chapter 2. Now, normally after all this frustration, I would swear not to give the developers any more money. But then I remembered that I write about games for a living, so I figured at the very least I should play it so I can tell others if it’s worth paying for. Again, the third chapter has no save points. And it’s only the first half, assuming we ever see the second half. It costs $2.99 again and it’s not that long. 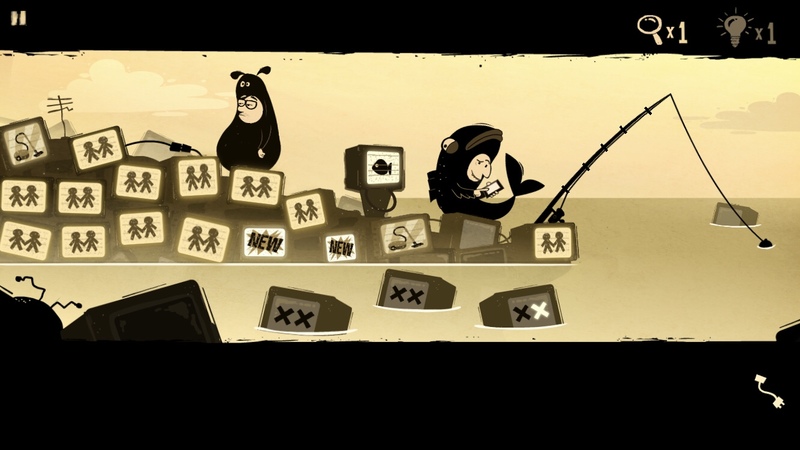 It does have some fun puzzles, though, and I enjoyed most of it. They added a second playable character, too, which means you can have them work together to complete tasks. But once again, there’s a very out-of-character set of mini puzzles that you have no way to skip. 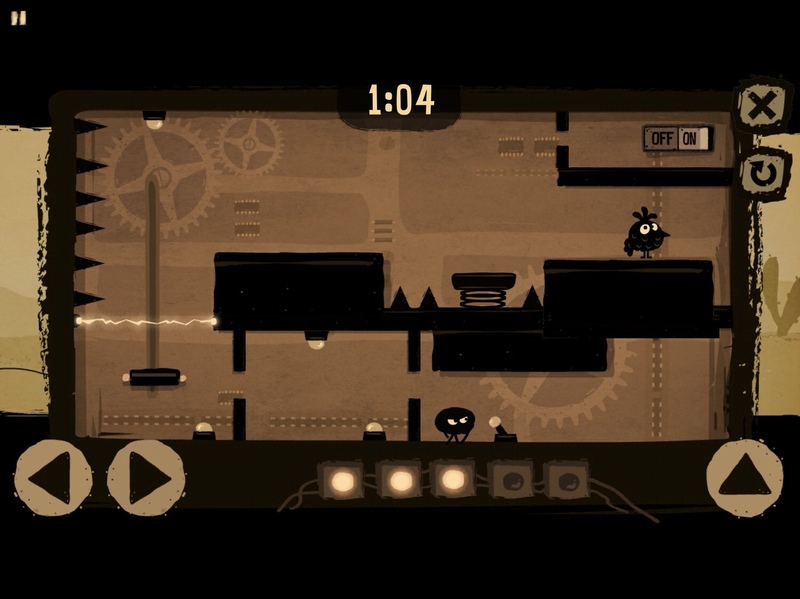 You need to get through five different platforming games with very wonky controls. You have left and right arrow buttons and a jump button. Normally, I would stay miles away from any game like this, but it was jammed into an adventure game I’m already playing, so what am I to do? Let me walk you through one of these sections so you can see just how bad it is. The goal in each one is to get to the on/off switch. 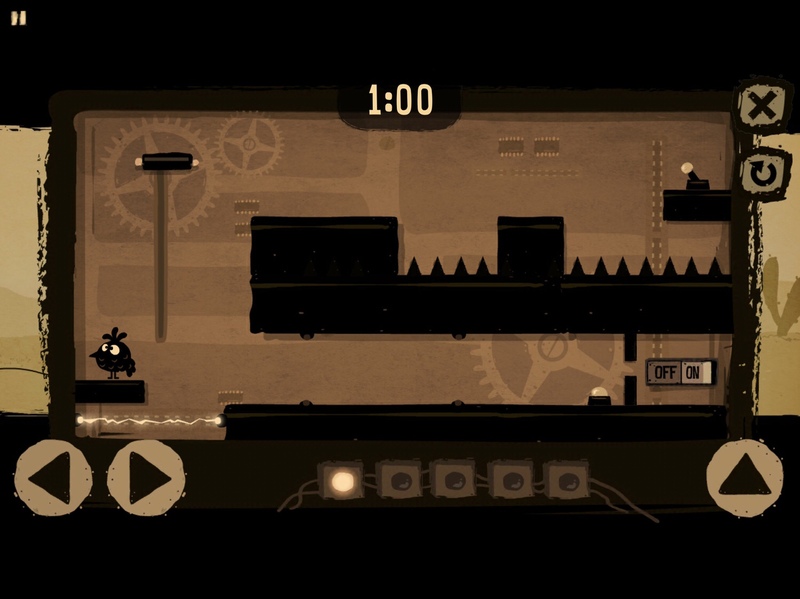 It’s not so clear in the screenshot below, but what you need to do here is jump over the gap to the right. There are two electric walls there that disappear for a few seconds if you wait. You need to get past those, hit the button, then head back left. The button activates the platform to the left that’s on a track. When you hit the button, the platform starts lowering. If you’re not super fast, then when you try to jump over the gap to the left again, the platform will be low and you’ll just hit your head and be electrocuted. Now you have to start over. You’re on a sixty-second timer, but this platform moves really slowly. But let’s say you manage to wait for it to rise again, cross the gap, wait for it to lower again, jump on it and get up to where the spikes are. Now you’ll likely learn that the bird’s jump won’t take you over the gap unless you’re basically off the platform already when you jump. Oops, you’re dead again! Start over! This is just a terribly punishing experience for people who never asked for it. I’m playing an adventure game, not a platformer. I didn’t sign up for this kind of punishment. Either make this section more forgiving, improve the controls, or just leave it out altogether and give me what I came for — puzzles! If all that wasn’t bad enough, the fifth and final platforming section even asks you to play in the dark! Because it painful enough while you can actually see what’s happening! On top of that, you’re jumping between moving platforms and there’s electricity above and below. So if you miss a platform you’re dead, but also if you just jump too high. It’s torture. I passed them, but the whole time I was angry that — remember? — I couldn’t take a break between them without losing my progress. There was no way I wanted to repeat any of these, so I just forced myself to push through until I finished them all. And there was no sense of accomplishment, no satisfaction. Just relief that I could get on with the rest of the game. The remaining puzzles were interesting and had minimal frustration, although there was one I could have done without that was on a timer. Still, it was less problematic that the others. The entire time, though, I was constantly aware of the fact that I couldn’t take a break because the game might get pushed out of my iPad’s memory and I’d lose all my progress. Is this the kind of experience the developers were going for? I hope not, but if so they succeeded. On top of all that, they sell hints but only give two for free, even after you paid $2.99 per chapter. It would have been nice to at least get a handful of them, considering they got our money already. And I still think it’s a big problem that Apple doesn’t require any sort of disclosure in the App Store description to let you know that each chapter costs $2.99 and that the game isn’t complete yet. I’m a big supporter of this try-before-you-buy payment model, as it usually means customers can see whether they like a game before spending their money on it. But a developer and a game like this just makes people less likely to trust other developers and less likely to give them their money. Once you’re scammed, you get suspicious of everyone. I would like to see the try-before-you-but model become the norm, but first stuff like this can’t happen. I hope Apple will step up their game and enforce disclosure of all in-app purchases and what they include. But for now, all I can do is warn you that you’re not getting the full game for $2.99. And I can’t recommend buying the extra chapters unless you have a ton of patience, perseverance, and don’t mind that you have to complete each level in one sitting. If that doesn’t describe you, just play the first chapter for free and move on until something changes. You can download the game here and try my step-by-step walkthrough guide if you get stuck.